Do you all even like reading what I'm writing about shows? I sometimes think no one likes these posts until randomly, months later, someone will bring up something or I'll ask what y'all want me to write about and "theater reviews" pops up in the top two. For my Chris Kennedy's sake, I will share with you my thoughts about my latest foray, Eric Jensen's Charlie's Aunt, in The Off-Broadway Theater in downtown Salt Lake City. The venue itself is worth the trip, I have to say - the building is quite antiquated and charming. Straight plays (no music) are not my forte. That being said, I'd heard many wonderful comments about this show and went into it with high expectations. If you need a good laugh and enjoy live theater, you will find that your $8 is well spent. I love that I am able to see live actors on the stage working their tails off to entertain me for the same price or less than a movie. Added bonus, I get to support my friends up on the stage. 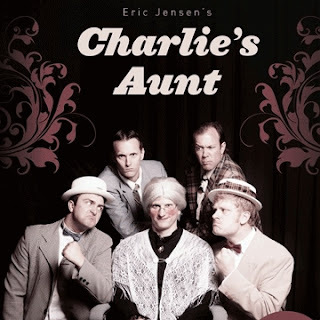 Eric Jensen's adaptation of Charlie's Aunt (read the original plot description here) is an American humor version of a more British humor show. A good pun always wins me over and there were an abundance of clever lines. Most of the actors were full of energy, especially the show-stealing lead, Rusty Bringhurst. I felt a little exhausted just watching him running all over the place. In fact, my friends and I even hunted him down after the show to tell him how much he impressed us. The chemistry between all of the male characters was fantastic and I truly believed each of them was smitten with his respective lady. The addition of Charlie's real aunt in the latter half of the show added to their chummy ensemble. The two women whom the two young men are courting do a swell job acting with each other and in general, but I had no sense that they actually liked their romantic counterparts. Maybe all of the times I have looked at someone with longing in my eyes and they have not returned that sentiment has made me a little too sensitive to lack of romantic reciprocation. The audience continued to laugh full-heartedly through curtain call, although the show, like most theater, is just a bit too long. I'm not a big laugh-out-loud person and even I erupted more than a dozen times. So, there you have it, my more-brief-than-normal thoughts and my full endorsement to go see this family friendly show. Oh, and Chris Kennedy's performance in this show is the best I've seen him do thus far - loves to you, Chris. The show runs Mondays, Fridays, and Saturdays through August 27 - get tickets here.